Stozzon is the only authorised medicine in Germany against unpleasant bad breath and body odour. Chlorophyll Dragees, with chlorophyll as the active ingredient, have no adverse side-effects but can successfully inhibit the development of unpleasant body odour and bad breath before it even begins. 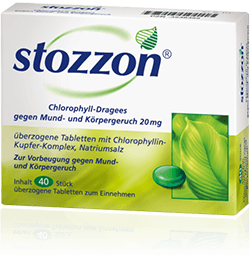 Stozzon has this inhibitive effect because of the special nature of chlorophyll, which can influence the activity of endogenous enzymes. Enzymes are involved in breaking down proteins from which unpleasant smelling substances can originate. Stozzon can help many people who are suffering from bad breath or body odour. This product does not suppress body odours. Ever since Patrick Süskinds published his novel “Perfume”, we have been able to see how important individual body odour is for our social identity. However, body odour can also have the opposite effect if the sour smell of sweat increases uncontrollably or if one person’s bad breath is chasing someone else away. The main cause of body odour lies in the formation of sweat. Sweating is a somewhat healthy and natural process – it helps to maintain a balanced body temperature. However, some people have a tendency to sweat excessively. The causes of this are primarily stress-related, but it could also be an indication of a metabolic disease or a result of being overweight. In any case, when sweat begins to decompose on the surface of the skin it results in an unpleasant, sour, sweaty smell. The development of this unpleasant odour constitutes a stress factor which, in turn, causes more sweat to form. From inside out, Stozzon can help to stop this vicious circle from occurring at all, as it can help to prevent the body odours caused by sweat production. This also applies to bad breath: The vicious circle must be broken. The same also applies for bad breath. With stress, tension and nervousness we are often left “cotton-mouthed”. But at the same time, a dry mouth is one of the main causes of bad breath which, again, constitutes a stress factor. Enzymatic digestive processes, which already begin in the mouth, have somewhat strong odour. That is completely normal, just as normal in fact as the saliva that carries these odours away and, in doing so, ensures that bad breath does not develop. With the enjoyment of certain foods, not drinking enough, poor oral hygiene, inflammatory illnesses and even just with stress, this protective function fails. With Stozzon you can successfully take countermeasures against bad breath and body odour by means of early prevention.